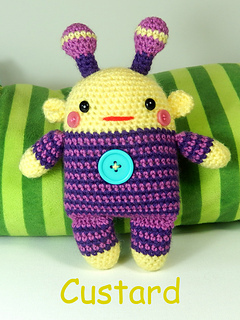 Romper Monsters, Amigurumi Crochet Doll Pattern. 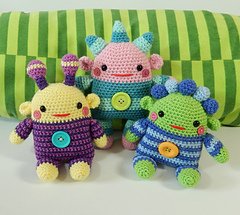 Bubblegum, Custard and Sprout are three of the sweetest and liveliest baby monsters you could ever hope to meet. With their rosy cheeks and snazzy little romper suits they just love bouncing into all kinds of mischief. If you don’t keep them busy with games of hide and seek and sing-a-longs to monster mash you might well find these cheeky little monsters chewing on the furniture and throwing their toys around. I know they look way too cute to cause such trouble, but you have been warned! 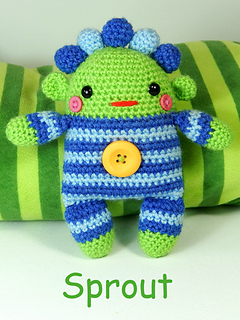 Easy and quick to crochet. Each Romper Monster measures approx. 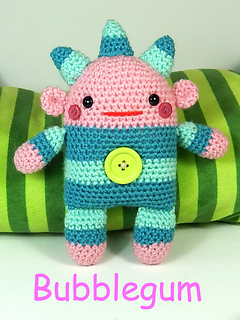 7” (18 cm) tall when made with light worsted weight (DK/8 ply) yarn and a size D (3.25mm) Hook.